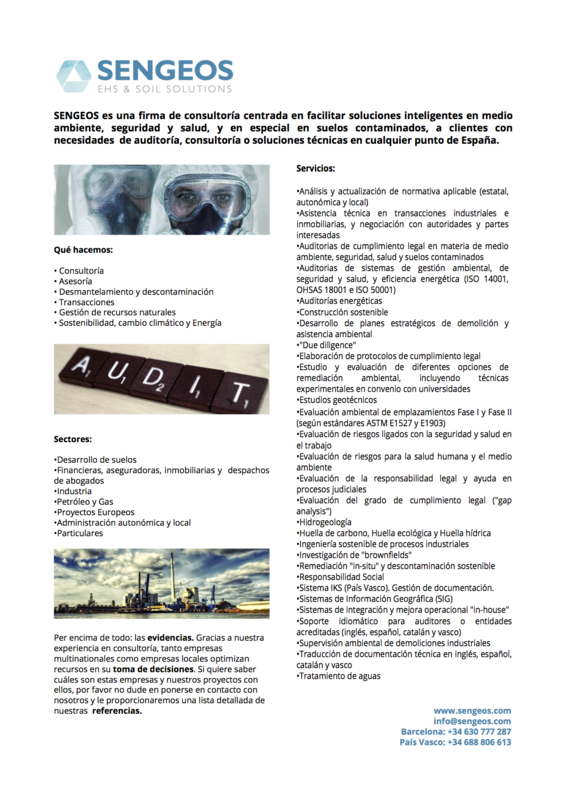 to clients with auditing, consulting and technical needs anywhere in Spain. SENGEOS invests in excellence and professional customer service. Inspired by the international experience of our technicians and having a good knowledge of the Spanish market, within an increasingly globalized world. Believing in the strength of our organization by the commitment and training of all members. Using the new technologies to improve communication and thus facilitate the decision-making processes. 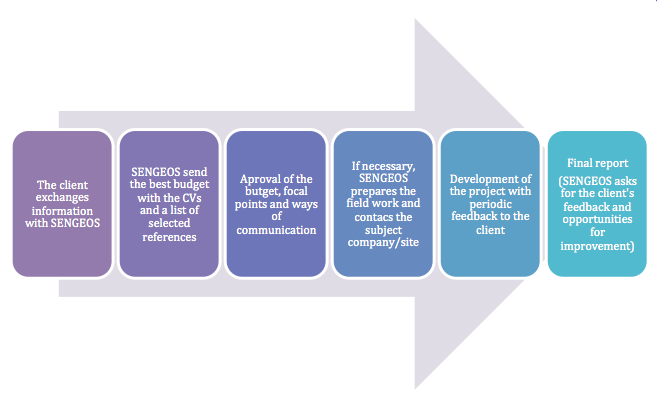 This is how SENGEOS manages quality EHS & Soil projects with full awareness of time and costs for the client. GEOS (for our Soil and Geological expertise). Employee-owned. All employees, with no restriction, participate in the decisions and benefits of the company. Proximity and presence in the territory. 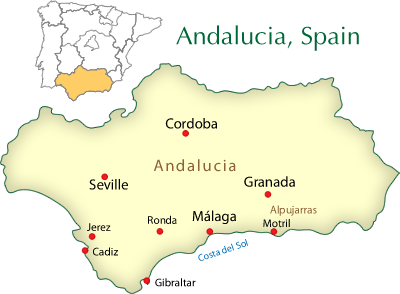 Our members (both, full time employees and strategic partners/allies) are present in the most industrialized regions of Spain. Wide use of new communication technologies. Aware of the importance of an effective and timely communication with clients, employees, contractors, stakeholders and even the authorities. A great, proactive and committed staff, highly experienced and specialized, with excellent adaptive capacities and communication skills. 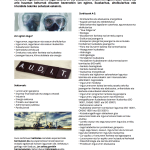 Timely and cost-effective projects, always with the higher quality and confidentiality. Total control, knowledge, advice and transparency at all phases of each project. Direct and agile communications with the authorities and private companies of any corner of Spain, making projects faster and more effective. An adaptive organization that is continuously mapping out the Spanish and global market, in order to be updated and fit the expectations of its local and international clients. A company that is prepared to ‘say no’ to a project if it is not within our expertise. A totally and really independent EHS & Soil consultancy firm. Above all, our consultancy experience is proven to help both, multinational and local companies, with their EHS & Soil decisions. If you want to know which are these companies and our projects with them, please, do not hesitate to contact us and we will provide you with a detailed list of our references. Because, in SENGEOS we Make Great Together. We want SENGEOS to be a reference among the EHS & Soil consultancy firms operating in Spain. To be a successful and sustainable company, where clients, employees and partners are always at the top of our priorities. In the end only one thing can separate a company from their competitors: its people. We’re proud of ours, proud of what we stand for, and how we work together. We believe that collectively our qualities genuinely help us deliver the best projects for our clients. 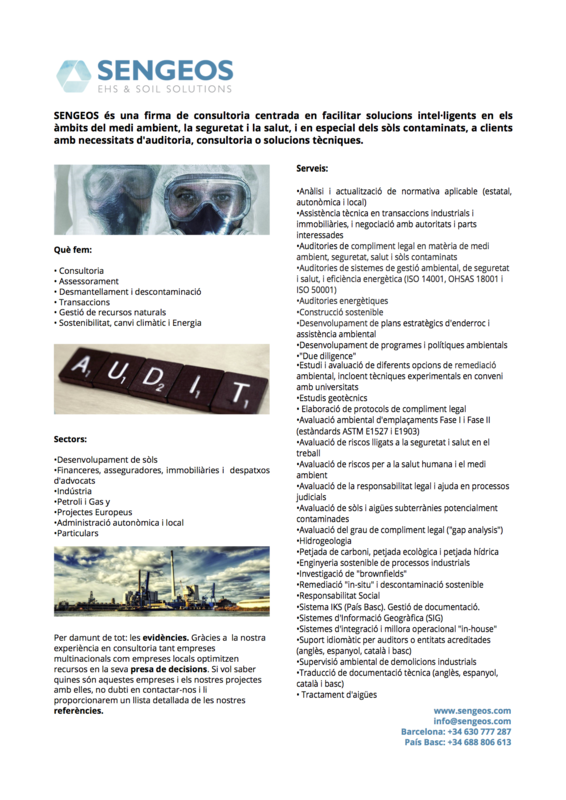 That is the reason why we have highly experienced consultants, auditors, technicians and project managers in the most industrialized regions of Spain. Healthy and Safety Caring Culture: SENGEOS prioritizes and promotes a healthy and safety culture among its employees, partners and clients. Ethics, Integrity and Transparency: SENGEOS is committed, at all times, to be an ethical, honest, reliable and trustworthy company. Excellence in Service: SENGEOS, by listening to their clients’ and employees’ needs, pursues the excellence in all their services. Collaboration and Empowerment: SENGEOS, as part of a connected community, is actively sharing knowledge and experience to bring value to all clients and employees. Effective Communication and Agility: SENGEOS, by widely using the new communication technologies, always delivers high quality, timely and cost-effective projects to the client. SENGEOS is committed to ethical behaviour and compliance with local, regional and national laws and regulations, including national and international anti-bribery laws. In addition, SENGEOS conducts its business in a responsible, safe and sustainable manner, through effective and positive interaction with our clients, partners, employees, the wider community and the environment. Engaging in ethical business practices is a commitment shared by all SENGEOS’ employees. So, we are proud in how our people conduct themselves with integrity, while delivering excellence to our clients all over Spain. Finally, as we are opening up to an absolutely globalized world, it is important to note that every employee in SENGEOS respects all other individuals, regardless if they are from another country, culture or religion. As a summary, SENGEOS is committed to comply at all times with the ten universal principles of the United Nations Global Compact (UNGC), regarding human rights, labour standards, environmental stewardship and anti-corruption. Working in a healthy and safety way is one of our Core Values at SENGEOS, and it guides how our employees work in the field, in our offices, at the different sites we visit and in our personal lives. What is more, SENGEOS also prioritizes and promotes a healthy and safety culture among its partners and clients. All employees in SENGEOS have been trained in Health and Safety. Some of them, due to its education, are even “accredited H&S technicians” according to the Spanish Ministry of Labour. SENGEOS’ technicians have long focused on helping our clients address soil, water, natural resources, energy and, in general, environmental needs. We have developed for them preventive and corrective programs that minimize their impacts on the environment. As in SENGEOS we do. 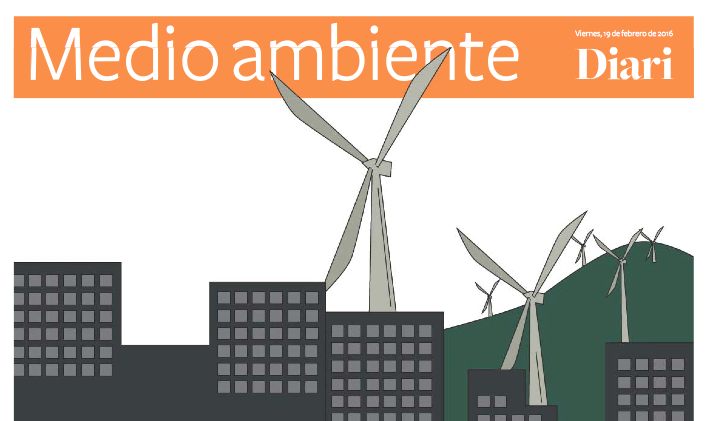 We try to reduce our impact on the environment basically by working locally thanks to the fact that our employees, partners and contractors, are based and present in the most industrialized areas of Spain (i.e. where our clients have the 95% of their needs). In addition, we have implanted and promote within SENGEOS sustainable practices to optimize resources, reduce costs and minimize our environmental impact. SENGEOS’ technicians have a wide experience in the advice of private and public land owners/developers with comprehensive, accurate, sustainable, timely and cost-effective EHS and Soil solutions. We participate in the assessment, acquisition, permitting, management, closing and/or decommissioning of plots of land anywhere in Spain. We give the client a continuous feedback and advice, particularly during fieldwork, in order to ensure that he has all the control and information necessary to take the most suitable and accurate decisions. SENGEOS’ technicians have a broad experience in the expert advice to finance, insurance, real estate & legal firms with interests in Spain. We provide consultancy services that merge legal, science and engineering disciplines with expert advice and pragmatic environmental, health and safety (EHS) & Soil solutions. Some of our EHS & Soil services comprise: due diligence, risk and feasibility assessment, permitting, compliance reviews, expert witness presentations, management of claims, asbestos surveys, hazardous materials sampling, investigation and remediation of contaminated lands, as well as the development and management of corrective and/or preventive plans. 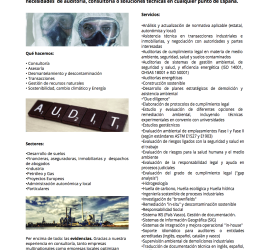 SENGEOS provides expert consultancy and auditing services to manufacturing and industrial companies operating in Spain. 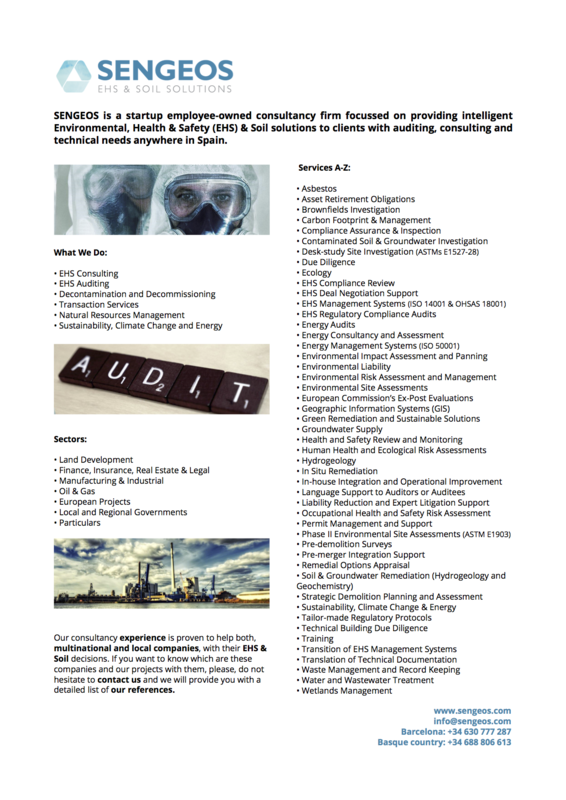 We help these companies to meet their environmental, health and safety (EHS) corporate goals, to be in compliance with their EHS regulatory requirements and to manage their EHS management systems (mainly certified by ISO 14001 and OHSAS 18001). 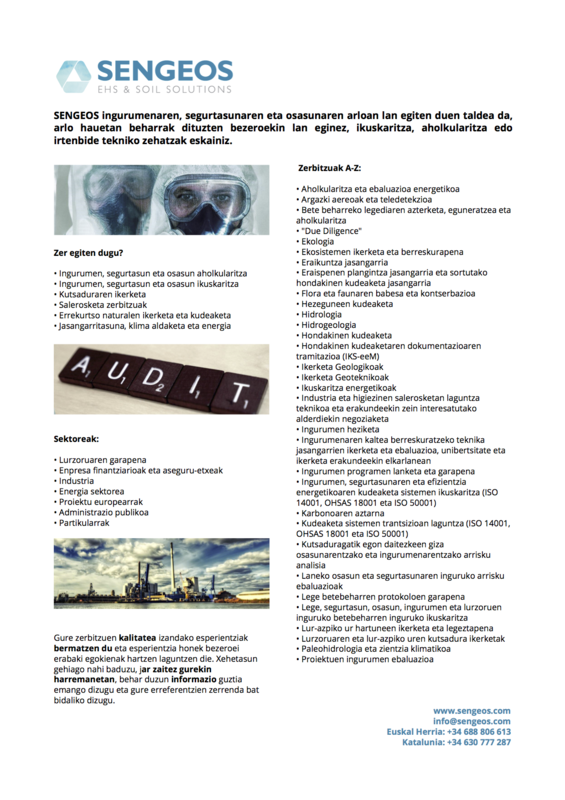 Although we provide EHS auditing and consulting services, as a principle for us, we never combine these two services to the same company. More specifically, in our consultancy work, we support manufacturing and industrial companies to the management of their EHS liabilities, risks, associated costs, permitting, regulatory compliance reviews, remediation, preventive plans, training, etc. As a complement, we also provide energy efficiency services aimed to improve their environmental performance. 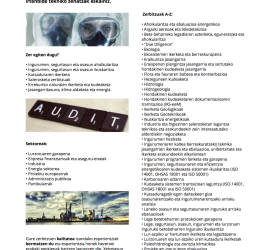 Regarding our auditing services the SENGEOS’ auditors, with years of auditing experience for multinational companies, work closely with clients to develop and conduct compliance audit programs to track and improve their EHS performance. 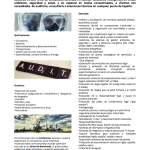 We optimize auditing costs thanks to an organized and diligent preparation of the fieldwork. As a consequence of this careful pre-audit work, we also reduce the disruption caused by these audits to the subject sites (and their always busy personnel). SENGEOS’ technicians have served different companies of the Oil & Gas (O&G) industry present in Spain. We have provided expert advice in the environmental, health and safety (EHS) regulatory compliance as well as in soil investigation and remediation projects (mostly for the refining and retail business units of such industry). We have collaborated with the O&G industry also in the field of transportation and storage (road transport, terminals, bulk storage, pipelines, etc. ), providing them with EHS & Soil solutions. 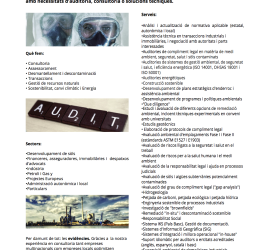 As a result of the wide experience of our technicians in providing EHS consultancy and auditing services, increased by our presence all over Spain, we have also collaborated with international consultancy firms in the development of private and public European projects. Of special relevance is our collaboration and support in the preparation, execution and presentation of European Commission’s Ex-Post Evaluations. 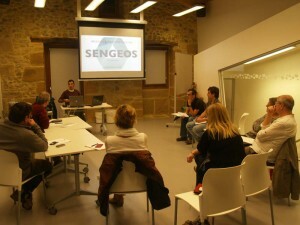 SENGEOS’ technicians have collaborated with local and regional governments all over Spain. We have provided consultancy, engineering and technical services to support these authorities in finding and implementing the best environmental, health and safety (EHS) & soil solutions to their needs. In SENGEOS we also serve to particulars with needs in the fields of environmental, health, safety, soil and hydrogeology. Some examples of services we offer to particulars are the investigation and remediation of contaminated soil (and associated groundwater) and the survey and removal of asbestos containing materials (ACMs). SENGEOS has developed integrated EHS solutions designed to address any need from our customers. 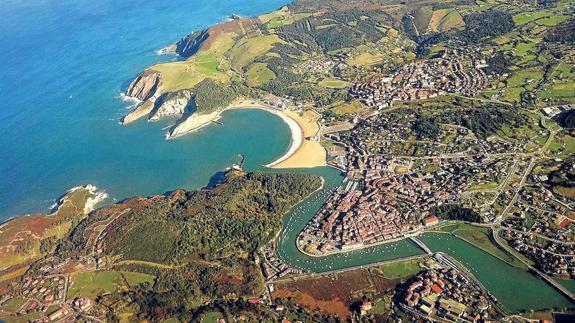 Our presence throughout the most industrialized regions of Spain provides an inter-disciplinary team with the depth of experience needed to accommodate the complexity and scale of any assignment. Our approach is always driven by the EHS market requirements and regulatory compliance, while reducing liability and costs. 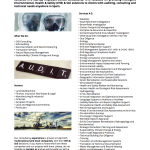 However, we can also help your company move projects beyond compliance towards EHS excellence. If you want to know more, please, do not hesitate to contact us and we will provide you with all the information you may need and a detailed list of references. And remember, in SENGEOS, combining the expertise of our technicians with a sector-driven approach, we can provide the right professionals and solutions with an in-depth understanding of your industry and the specific EHS issues you face. 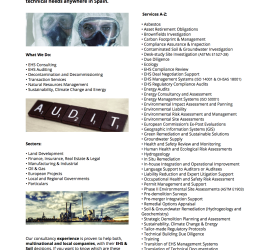 SENGEOS’ auditors have been providing expert environmental, health and safety (EHS) auditing services, of different kind, to national and multinational customers for many years and across many industry sectors. 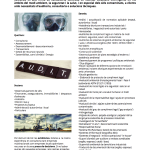 •	Language Support to Auditors or Auditees (English, Spanish, Catalan and Basque languages). SENGEOS offers integrated EHS & Soil solutions designed to address any need from our customers. Our presence throughout the most industrialized regions of Spain provides an inter-disciplinary team with the depth of experience needed to accommodate the complexity and scale of any assignment. Our technicians have been providing consultancy and technical environmental, health and safety Transaction Services to national and multinational customers for many years. We have been working hand in hand with the most important international consultancy firms with acquisitions, divestitures, mergers, joint ventures, property sales and property leases projects all over Spain. In addition, SENGEOS is currently working in the consolidation of consultancy and technical services in Renewable Energies, in special in Geothermal Energy. 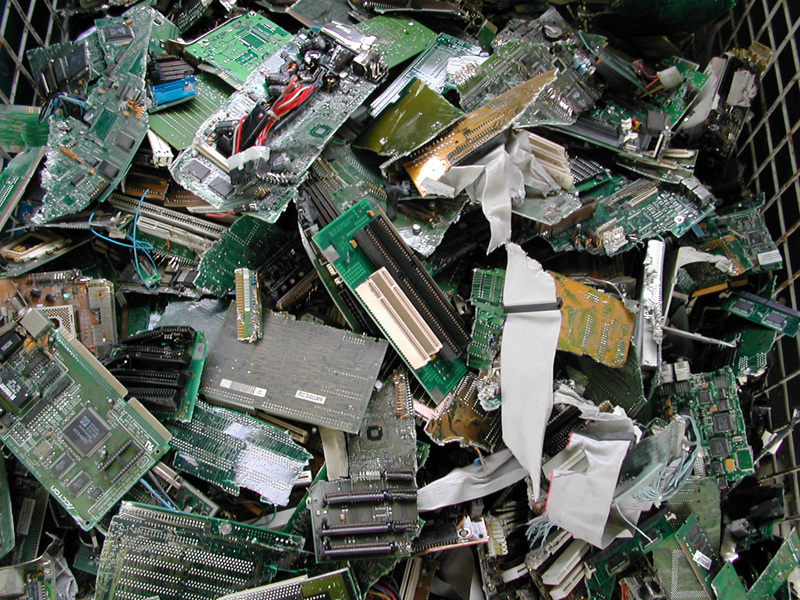 Royal Decree 183/2015, amending the Environmental Liability framework in Spain. We are always looking for talented people to join our team. Because, whilst the systems help, it is the people who get things done! With SENGEOS you can work to your strengths whilst benefiting from the advantages of becoming part of acommitted and experienced team of EHS & Soil professionals. So, if you share our values and if you are talented, committed, hard-working and meticulous, contact us to find out what we might achieve together. You can send your CV or LinkedIn profile to info@sengeos.com, and we will contact you as soon as possible. In SENGEOS we Make Great Together. This text constitutes the disclaimer of the website owned by SENGEOS EHS & SOIL SOLUTIONS (hereinafter, SENGEOS) located at the URL www.sengeos.com. SENGEOS is an entity whose registered corporate address is Carrer Marina, 65-67, 08005 Barcelona. To communicate with SENGEOS directly and effectively, you can send an e-mail to info@sengeos.com or call by phone at +34 630 777 287. Esta página web es propiedad de SENGEOS EHS & SOIL SOLUTIONS (en adelante, SENGEOS) ubicada en la URL www.sengeos.com. SENGEOS es una entidad cuyo domicilio corporativo se encuentra en calle Marina, 65-67, 08005 Barcelona. Para comunicarse directamente con SENGEOS puede enviar un e-mail a info@sengeos.com o llamar por teléfono al +34 630 777 287. Al acceder a este sitio web, usted acepta que quedará vinculado por estas Condiciones de Uso, por toda la normativa legal aplicable y que es responsable del cumplimiento dicha normativa. Todo el contenidos de este sitio web está protegido por derechos de autor y marcas registradas. Web orri honen jabetza SENGEOS EHS & SOIL SOLUTIONS-ena (SENGEOS aurrerantzean) da, www.sengeos.com URL-an kokaturik egonik. SENGEOS Bartzelonako (08005) Marina kaleko 65-67 zenbakietan etxebizitza korporatiboa duen taldea da. SENGEOS-ekin zuzenean komunikatu ahal izateko e-mail bat bidali dezakezu info@sengeos.com helbidera edo telefonoz dei dezakezu +34 688 806 613 zenbakira. Usamos cookies para optimizar el funcionamiento de esta web. Si continuas navegando por ella entenderemos que estás conforme con estas cookies. Para más información consulta nuestra política de cookies y cómo gestionarlas. Cookie-ak erabiltzen ditugu web orriaren funtzionamendua hobetzeko. Web orrian jarraitzen baduzu hauekin ados zaudela ulertuko dugu. Informazio gehiagorako gure Cookie politika kontsulta ezazu.